With the win, JSU (11-13, 7-6) bounced back with a huge victory and now sit in sixth place and one game behind Alabama A&M for fifth in the conference race. Jackson, Miss. – A key third quarter run helped Jackson State beat Texas Southern 73-64 Monday evening at the Lee. E. Williams Athletic and Assembly Center. JSU forward Marneisha Hamer scored 20 points and guard Christina Ellis scored 11 of her 19 points in the second half that included a big run in the third quarter. With the win, JSU improves to 11-13 and 7-6 in SWAC play. Jackson State (11-13, 7-6) bounced back with a victory after a disappointing 89-80 loss to Prairie View Saturday evening and now sit in sixth place and one game behind Alabama A&M for fifth in the conference race. Meanwhile, Texas Southern (11-13, 6-6) is tied with JSU for sixth in the league. Tomekia Reed, the Lady Tigers head coach, credited the defense output early in the second half from her players as the key in helping her team pull away from TSU in the game. “Christina down the stretch had big steals back to back and that helped us tremendously walk away from Texas Southern early,” Reed said. Kaisah Lucky also finished in double figures for the Lady Tigers with 13 points and eight assists. As a team, JSU shot the ball exceptionally at 57.1 percent off 28-of-49 shooting from the floor and nearly 62 percent (13-of-21) from the free throw line. Niya Mitchell and Richelle Velez led Texas Southern in scoring with 22 points and 16 points respectively. Velez, who started the game off hot from beyond the arc, was limited in her three-point opportunities thanks to the Lady Tigers defensive pressure on the perimeter. “We went into 1-3-1 zone defense just to match up with her,” Reed said. TSU finished the game shooting 44.6 percent off 25-of-56 shooting from the floor, 31.6 percent (6-of-19) from three-point range and 57.1 percent (8-of-14) from the charity stripe. Jackson State held off a fourth-quarter frenzy. The Lady Tigers led by as many as 11 before TSU made a run and cut the deficit to 68-62 with 1:29 to play in regulation. 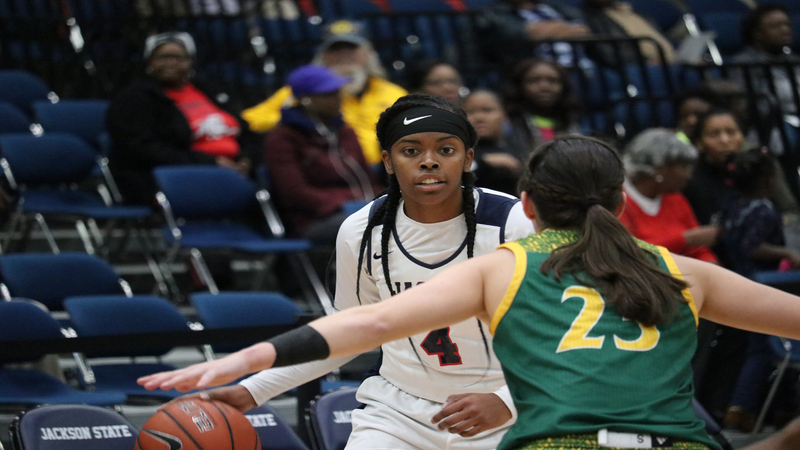 Free throws down the stretch – something that has always been a major issue for JSU – helped the Lady Tigers secure the victory. In the third, both teams continued to exchange baskets but JSU held onto a 46-43 lead with 3:30 to play in the period. Following a free throw from Lucky, the Lady Tigers went on an 11-2 run in which Jackson State scored in three fast-break layups from Ellis and a jumper from Causey to take a 56-45 lead into the final period. Trailing 18-13 to begin the second, Hamer added another jumper before Texas Southern went on an 11-6 run and took a 29-21 lead with 4:50 to play until halftime. Jackson State responded with a 7-0 run to tie the game at 29. Over the next several possessions, the teams exchanged baskets and went into halftime tied at 36. Texas Southern jumped out to an early 11-2 lead with solid shooting from the field and from the beyond the arc from Olivia Cunningham and Velez. JSU, however, would come to life as the Lady Tigers began hitting buckets behind the play of Hamer, who scored six points in the first quarter. Jackson State returns to action on Saturday afternoon as the Lady Tigers host Grambling State, a team that will look to get a bit of redemption against JSU after losing at home 77-74. As for Reed and her team, they will be ready. “We got to keep our same game plan and make some minor adjustments and be efficient around the basket,” Reed said.